Mesothelioma is difficult to diagnose for many reasons. Currently, only a biopsy can definitively confirm mesothelioma. Nonspecific symptoms and a long latency period make a proper diagnosis difficult. Mesothelioma is often misdiagnosed as other common illnesses. A biopsy is currently the only method to confirm a mesothelioma diagnosis. Prognosis and treatment options will depend on the specifics of the diagnosis. An early diagnosis is important for any disease or condition to ensure patients are treated as quickly and effectively as possible. However, early diagnosis is especially crucial for malignant mesothelioma, as it can greatly impact survival rate. Diagnosing mesothelioma isn’t always easy, for physicians or patients. In addition to analyzing symptoms, diagnosis typically includes detailed observation of medical history and physical examinations, several imaging scans, blood tests, and biopsies. With continued research into mesothelioma diagnosis and treatment, specialists are uncovering new methods to potentially aid the diagnosis process. Diagnostic tests are the key way to identify and diagnose mesothelioma. The three most common types of types include imaging scans, blood tests, and tissue biopsies. Doctors will typically start with imaging scans, as they are the least invasive, and follow up with additional tests if they are warranted and viable based on the patient’s condition. A standard diagnostic workup for mesothelioma includes imaging of the affected area, such as the chest, abdomen, or heart. Unfortunately, imaging studies cannot definitively diagnose mesothelioma by themselves. Nonetheless, imaging studies provide critical information that may help physicians make or rule out the diagnosis of mesothelioma, determine the stage of cancer, and make future diagnostic and treatment decisions. An x-ray is often performed on the problem area of the patient, to help identify any masses and find early signs of mesothelioma, such as fluid buildup. A computerized tomography (CT) scan takes a series of x-ray images to create a detailed 3D image, allowing tumors to be discovered easily. A CT scan is approximately 90% sensitive for detecting malignant pleural mesothelioma. Magnetic resonance imaging (MRI) uses powerful magnets to create high-resolution 3D images of the patient’s internal anatomy. The detailed images of an MRI can be useful for planning a biopsy or surgical removal of the mesothelioma tumor. Positron emission tomography (PET) is a nuclear medicine imaging technique. PET is excellent at identifying cancer and distinguishing between malignant and benign disease. Mesothelioma, like all cancers, produces substances that are not normally found in the bloodstream. Ideally, a physician could test for these substances in a patient’s blood and be able to diagnose or rule out mesothelioma without a biopsy or surgery. While several promised mesothelioma biomarkers exist, none is yet able to definitively diagnose mesothelioma. Nevertheless, biomarker tests, also known as “assays,” may provide useful information and could be part of a mesothelioma diagnostic workup. Mesomark: The Mesomark assay is a blood test that detects fragments of mesothelin, a substance produced in large amounts by malignant mesothelioma. N-ERC: N-ERC/Mesothelin is another protein that can be found in the bloodstream when a patient is suffering from mesothelioma. Osteopontin: Osteopontin is another molecule that accumulates in various types of cancer, including mesothelioma. Fibulin-3: Blood levels of fibulin-3 are abnormally elevated in people with pleural mesothelioma and may be used with other testing to diagnose malignant mesothelioma and differentiate from other benign lung diseases. HMGB1: Testing for the HMGB1 protein can reveal a mesothelioma diagnosis in patients and may also identify patients who have been exposed to asbestos, but have not yet developed mesothelioma. Currently, a biopsy procedure is the only way to confirm a mesothelioma diagnosis in patients exhibiting symptoms and with a history of asbestos exposure. The intention of a biopsy is to collect a sample of cancerous tissue to be examined under a microscope. Histology and cytology can then be used, helping determine if the tumor is mesothelioma or another cancer, identify the stage of the disease and help determine the course of treatment. Some biopsy techniques are minimally invasive while others are a major surgical procedure. Researchers continue to look for new methods for identifying mesothelioma and have experienced some success. Oftentimes, studies will look at markers that were helpful in addressing other types of cancer, then test their viability with mesothelioma diagnoses. Researchers have found that exosome, substances produced by cells and found in the bloodstream, may signal the presence of certain cancer cells. Recent studies have shown a correlation between certain exosomes and patients with malignant pleural mesothelioma. Studies have shown that a multicapillary column/ion spectrometry (MCC/IMS) breath test can help identify those were exposed to asbestos and may be at higher risk to developing malignant mesothelioma. Mesothelioma is a rare disease, and not as well understood as others. This, along with many other factors has made diagnosis challenging. Unfortunately, diagnosing mesothelioma takes a long time. While mesothelioma is widely talked about and publicized, it is still a rare condition. Even if patients have symptoms of mesothelioma, it may take several visits to a primary care physician for mesothelioma to be suspected. Several issues delay mesothelioma diagnosis, including nonspecific symptoms and a long latency period. Mesothelioma has a poor prognosis for most patients by the time it is diagnosed. Because of this, early diagnosis of mesothelioma is paramount. If you or a loved one has a history of exposure to asbestos, it is best to monitor your health closely. 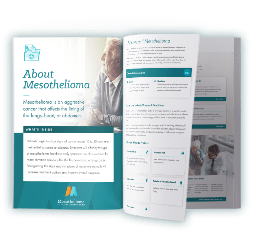 Determining a mesothelioma diagnosis early means that patients will typically be in better health, the cancer will be localized, and the options for more aggressive treatments will be available. Because early detection of the cancer is so important, recent studies of mesothelioma have focused on discovering more accurate diagnostic tools and procedures, like mesothelioma biomarkers and blood tests, that can detect the presence of mesothelioma earlier in the diagnosis process. Mesothelioma is often misdiagnosed because it is so rare, is related to asbestos exposure that may be decades in the past, and can cause symptoms that mimic so many other diseases. Due to these factors, mesothelioma may be misdiagnosed as some other lung or abdominal disease. A mesothelioma diagnosis can be extremely jarring. However, there are others that have gone through it and many resources to turn to. Patients should plan ahead and gather all of the information needed to make informed, confident decisions when moving forward with their treatment. Once a diagnosis of mesothelioma is made, the patient should figure out a medical care team. Each patient should be treated by one or more physicians who specialize in the treatment of mesothelioma, which may include a medical oncologist, surgical oncologist, thoracic surgeon, and a pulmonologist. Before pursuing this step, some patients decide to get a second opinion. A second opinion can provide peace of mind and potentially provide patients and their families with more insight into their options. Not every doctor is able to address mesothelioma. However, there are mesothelioma specialists experienced in dealing with this type of malignancy, some specializing in certain types of malignant mesothelioma. Most patients with mesothelioma undergo multimodality or trimodality therapy, which includes surgery, chemotherapy, and radiation therapy, in some order. Patients who have been diagnosed with mesothelioma should consider participating in a clinical trial. These clinical trials are designed to provide standard mesothelioma treatment with the possible addition of a newer, experimental therapy. Following initial treatment for mesothelioma, patients enter a period of cancer recovery and survivorship. Cancer survivors may choose to participate in a survivorship care plan, which includes a summary of treatment and a detailed plan that includes follow-up appointments and surveillance for recurrent disease and treatment side effects. The overarching goal of a survivorship care plan is to ensure that patients with mesothelioma continue to receive care and support during recovery. 1 American Lung Association. Lung Health & Diseases: Diagnosing and Treating Mesothelioma. Updated April 4, 2018. 2 Augeri S, Capano S, Morone, et al. Soluble CD157 in pleural effusions: a complementary tool for the diagnosis of malignant mesothelioma. Oncotarget. April 27, 2018;9(32):22785-25237. doi:10.18632/oncotarget.25237. 3 Lamote K, Vynck M, Cleemput JV, et al. Detection of malignant pleural mesothelioma in exhaled breath by multicapillary column/ion mobility spectrometry (MAA/IMS). Journal of Breath Research. September 26, 2016; 10(4). doi:10.1088/1752-7155/10/4/046001. 4 National Cancer Institute. Malignant Mesothelioma Treatment (PDQ®)–Health Professional Version. Updated July 27, 2018. 5 Zandwijk NV, Clarke C, Henderson D, et al. Guidelines for the diagnosis and treatment of malignant pleural mesothelioma. Journal of Thoracic Disease. December 2013;5(6):E254-E307. doi:10.3978/j.issn.2072-1439.2013.11.28.